According to the March for Our Lives website, more than 800 events, worldwide, were scheduled for Saturday, March 23, including events in North Charleston, Columbia, and Greenville. 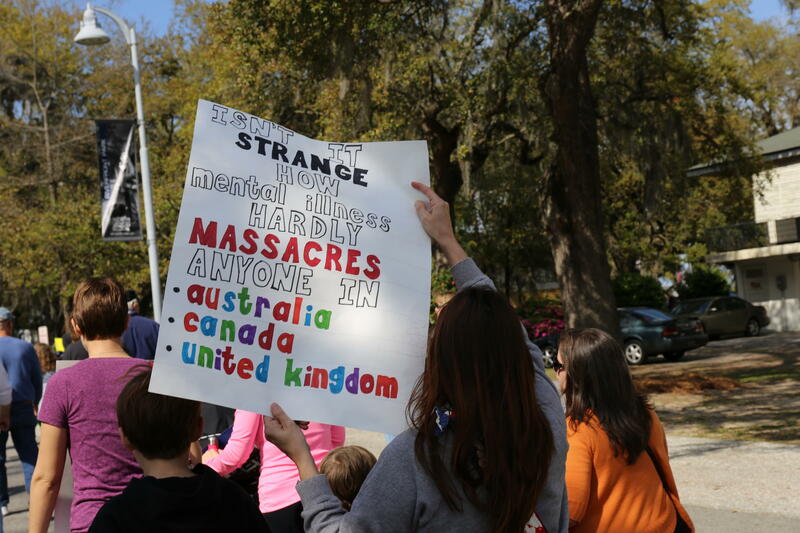 In North Charleston, Allison Welch carried a sign her eight-year-old son made. She shared with South Carolina Public Radio’s Victoria Hansen why she was marching. Retired school teacher Virginia Thomas marched with her husband in North Charleston. The two were active in many civil rights activities in the late 1960s and 1970s. They shared with Hansen that it’s their grandchildren and great-grandchildren that are the reasons they are marching once again. Following the shooting in Florida, South Carolina law enforcement officers and legislators called for a new law that targets people, including youth, who threaten schools. Senate Bill 431, sponsored by Charleston Sen. Sandy Senn, would levy fines or prison time to anyone who threatens schools. If someone were to act on that threat, and caused injury or death, they could be charged with a felony. 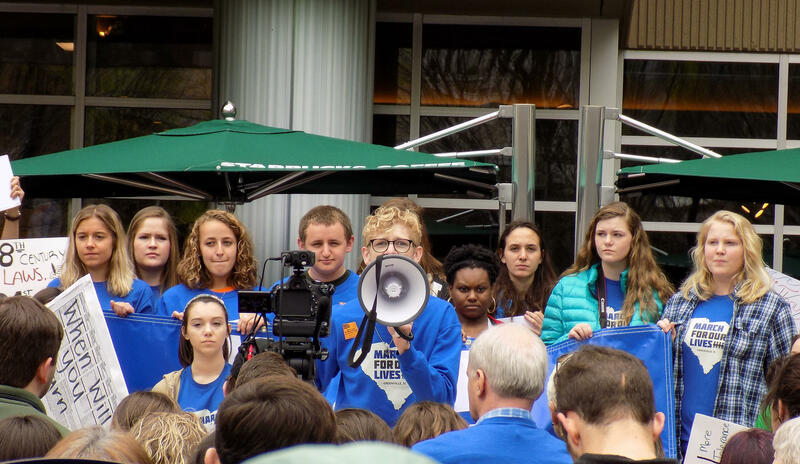 In Greenville, March for Our Lives organizer Avner Goldstein Mittag lead a group of about 2,000 students and supporters from NOMA (North Main) Plaza to City Hall. He said that while he nor any other Greenville organizers were victims of a school shooting or personally impacted by gun violence, they were a part of a generation that was. 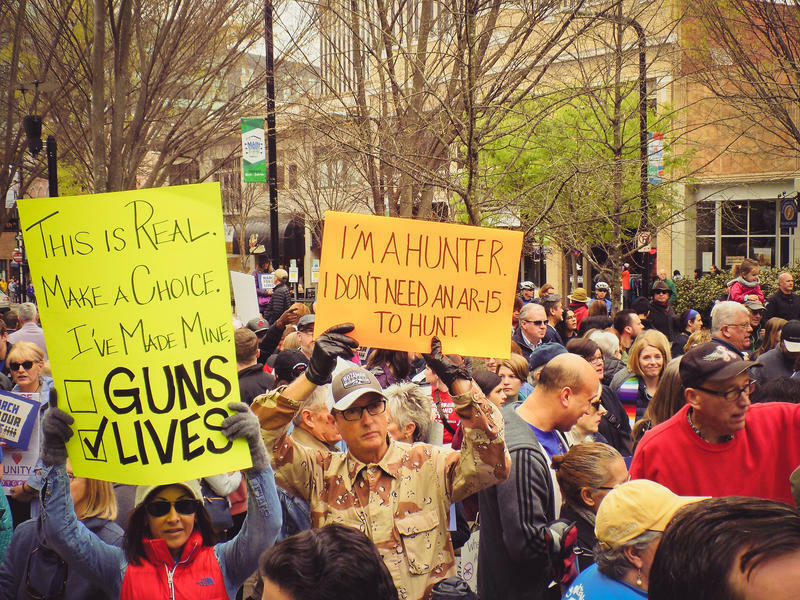 Mittag spoke with South Carolina Public Radio’s Thelisha Eaddy about what he wants South Carolina lawmakers to take away from Saturday’s event. March for Our Lives Greenville Organizer shares what he wants South Carolina lawmakers to take away from the rally. Mittag said early on, there were rumors that counter-protestors would also be demonstrating near the March for Our Lives rally. When asked if given the opportunity to sit and talk with people of opposing views, he replied, "Hopefully after this march ends and the counter-demonstration end, we can come together and discuss why we might have those disagreements and hopefully find a more common solution." Mittag and his group have already taken a step in that direction. 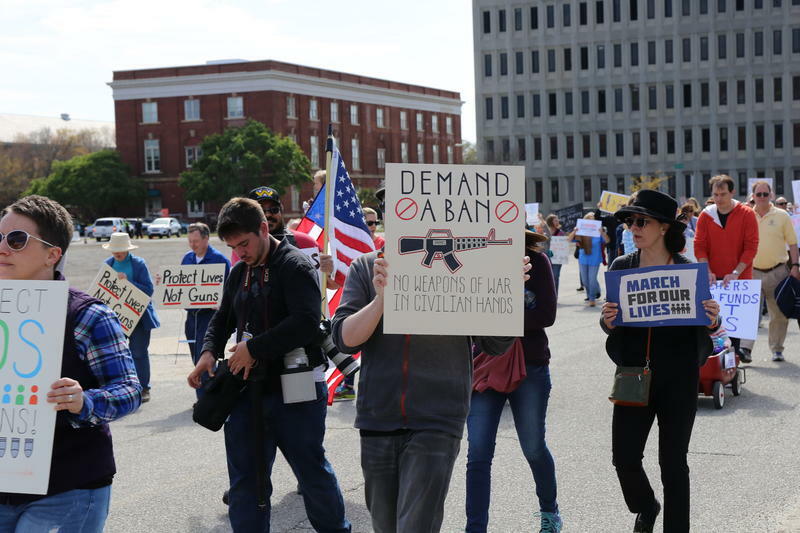 Walking with the March for Our Lives demonstrator were members of South Carolina Carry, Inc., a political action group that wants constitutional carry passed in the state. Greenville County leader Matt Wavle said his group is there to provide extra security. The Friday before the event, he said he didn't expect there to be a great deal of negative interaction between picketers and marchers. "We're there just in case to try to encourage people that may agree with our policy... to help them understand that the 2nd Amendment is not the only one there," Wayle said, "you need to respect all of people's constitutionally protected civil rights." In Columbia hundreds marched to the state capitol carrying signs that read "Make America Safe Again," "Students Rights are Human Rights," "Enough," and many other messages. South Carolina Public Radio’s Vince Kolb-Lugo spoke with students and parents during the protest. 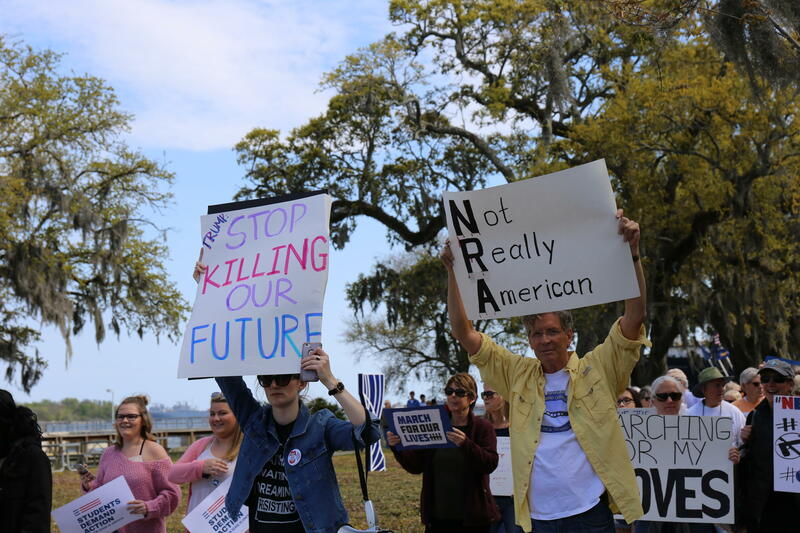 South Carolina Public Radio's Laura Hunsberger spoke with Perry Bradley, executive Director of Building Better Communities (BBC), the sponsoring organization of the March for Our Lives Columbia Rally. He said the motivation surrounding this movement is high and that he hopes adults start taking young people more seriously. "Now is the time for us to see just how much they've been listening, how much they are willing to learn, and how much they are willing to step up," Bradley said. Its estimated over 3,000 people attended the Columbia rally. Perry Bradley shares with Hunsberger one reason he thinks the event was so successful. LISTEN: Bradley shares why he thinks the Columbia rally was so successful. Other organizations that worked to realize the event included students from the University of South Carolina and various high schools in the Midlands; the Faith Coalition on Gun Violence; the Richland County Sheriffs office; and the City of Columbia Police Department. BBC is a grassroots organization designed to bridge the gap between local law enforcement and communities. Perry Bradley said during the march, the group also announced a new program that will focus on PTSD in children. He said the program will teach how to recognize PTSD and how to treat it. Victoria Hansen, Laura Hunsberger, and Vince Kolb-Lugo contributed to this report.